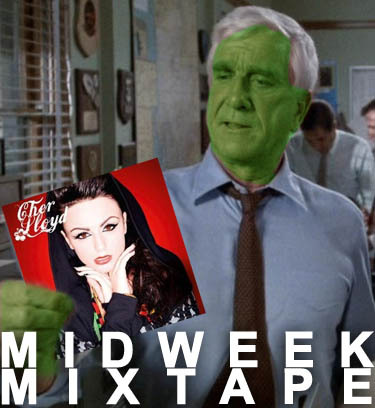 Drebin accidentally listened to X-Factor drone Cher Lloyd’s début, the ludicrously-named chart-molesting song Swagger Jagger. FIRST! Anna-Anna is further proof that Rio de Janeiro’s music scene is an extremely fertile one, the city regularly spewing forth small, complex and exciting bands. Anna-Anna is indeed one of these, although Cat Eyes proves to be one of the more esoteric efforts: spooky, intimate and seductively weird. SECOND! This is Vladimir‘s full email to ANBAD: “We aim to play as loud and creat as much chaos at gigs as possible recently resulting in us being band from our local university after a gig. we dont care for influences and just play what we want. if you could feature us that would be great if not at least you have listend.” SOLD. THIRD! The Pineapple Chunks’ song (Magicland) Dizzy is about my favourite ZX Spectrum game of the same name, which involved controlling a cheerfully sentient egg in a fantasy world. The song is appropriately happy and colourful. Note to new bands: songs on this or similar ZX Spectrum-related topics guarantees coverage. FOURTH! Danny Fingers has made a surprisingly touching song about a flint with a San Franciscan barista, called, er, San Francisco Barista Weekend Fling. It’s a song that seems to find depths of feeling and warmth despite itself, and is a small, sweet delight. Posted on July 6, 2011 by Joe Sparrow. This entry was posted in Headline, Today's New Band. Bookmark the permalink.